We held two public drop in sessions in August 2018 which were well attended by over 300 people from the local community. We logged a number of comments to take away for review as part of our detailed design. We have produced a document with some information about some of the key themes that were raised at the events. Our on site preparatory works for the scheme will become more visible in the coming months as we aim to get as best possible start for the main works in March 2019. This will include clearing vegetation and relocating underground services such as water and gas pipes if needed. We'll also be finalising our detailed design for the scheme, this should be finished by the end of this year. The A69 is an important route between Newcastle and Carlisle that helps connect Scotland and the Tyne and Wear. It provides an arterial link between the north east and north west of England that is heavily used by hauliers and commuters. However, the A69 between Hexham and Newcastle is a particularly busy section, and there are often delays at peak travel times, particularly at the Bridge End and Styford roundabouts. 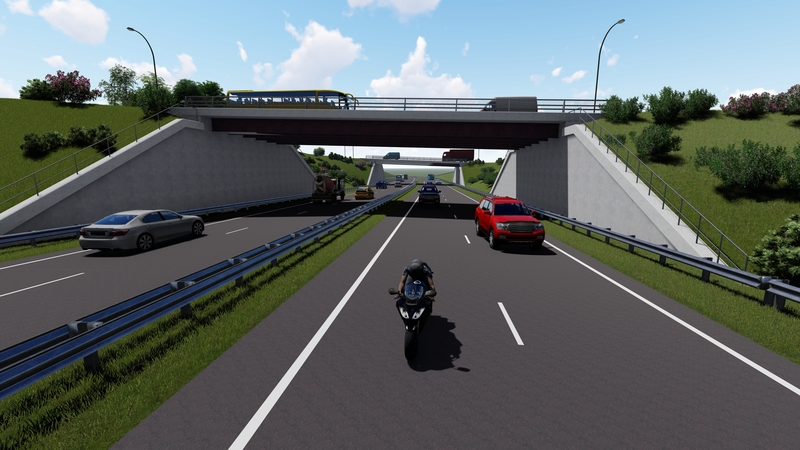 In recognition of the importance of this route, in 2016 we carried out the Northern Trans-Pennine Strategic Study which looked at how we could improve the A66 and A69, to increase trans-Pennine connectivity. As a result of this study, in March 2017 we announced a £220 million package of improvements as part of our congestion relief fund. This included two junction improvements along the A69, one at the A69/A6079 Bridge End roundabout and one at the A69/A68 Styford roundabout. We'll make improvements to the A69/A6079 Bridge End and the A69/A68 Styford roundabouts as part of our package of improvements to relieve congestion. We plan to turn the current junctions, which are traditional roundabout arrangements into grade-separated junctions (you’ll have to go up or down a slip road to leave the A69). This means that traffic travelling along the A69 between Hexham and Newcastle will no longer have to stop at these junctions, allowing motorists a free-flowing journey. At Styford junction the A69 will be built over the roundabout. At Bridge End junction the A69 will go underneath the roundabout. 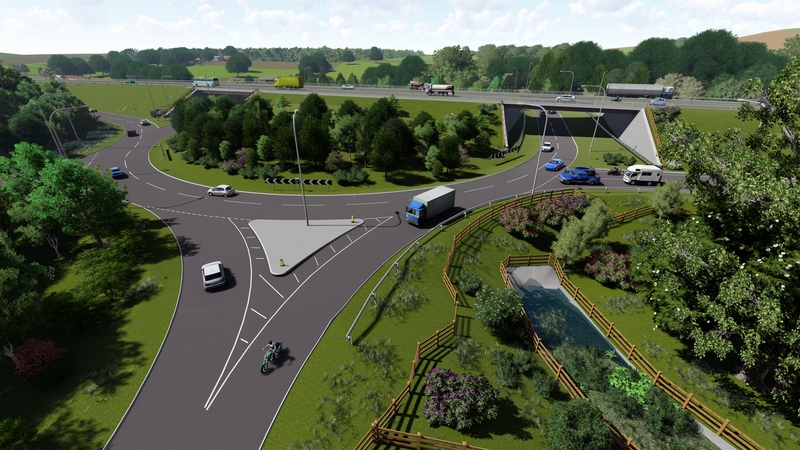 Our proposals will incorporate new bridges as well as upgrading the existing roundabouts where required. We’ll build both junctions at the same time but will start work on the Bridge End junction slightly earlier so that we can minimise waste by using leftover materials to construct Styford. Location : The A69 westbound between the junctions with the A6085 and the A68 east of Corbridge. Lane Closures : Lane two will be closed. Reason : Roadworks are planned. Status : Pending. Schedule : From 08:00 on 29 April 2019 to 16:30 on 28 May 2019. Lanes Closed : There will be one of two lanes closed. Location : The A69 westbound between the junctions with the A68 west of Corbridge and the A6079 north of Hexham. Lane Closures : Lane one will be closed. Reason : Roadworks are planned. Status : Pending. Schedule : From 09:00 on 29 April 2019 to 16:00 on 29 April 2019. Lanes Closed : There will be one of two lanes closed. Location : The A69 westbound between the A68 east of Corbridge and the junction with the A68 west of Corbridge. Lane Closures : Lane one will be closed. Reason : Roadworks are planned. Status : Pending. Schedule : From 09:00 on 30 April 2019 to 16:00 on 30 April 2019. Lanes Closed : There will be one of two lanes closed. Location : The A69 eastbound between the junctions with the A68 east of Corbridge and the A6085 . Lane Closures : Lane one will be closed. Reason : Roadworks are planned. Status : Pending. Schedule : From 09:00 on 2 May 2019 to 16:00 on 2 May 2019. Lanes Closed : There will be one of two lanes closed. Location : The A69 eastbound between the A68 west of Corbridge and the junction with the A68 east of Corbridge. Lane Closures : Lane one will be closed. Reason : Roadworks are planned. Status : Pending. Schedule : From 09:00 on 30 April 2019 to 16:00 on 30 April 2019. Lanes Closed : There will be one of two lanes closed. Location : The A69 eastbound between the A68 west of corbridge and the junction with the A6085 . Lane Closures : Lane one will be closed. Reason : Roadworks are planned. Status : Pending. Schedule : From 09:00 on 1 May 2019 to 16:00 on 1 May 2019. Lanes Closed : There will be one of two lanes closed. Location : The A69 westbound between the junctions with the A6085 and the A68 east of Corbridge. Lane Closures : Lane one will be closed. Reason : Roadworks are planned. Status : Pending. Schedule : From 09:00 on 2 May 2019 to 16:00 on 2 May 2019. Lanes Closed : There will be one of two lanes closed. Location : The A69 eastbound between the A6079 north of Hexham and the junction with the A68 west of Corbridge. Lane Closures : Lane one will be closed. Reason : Roadworks are planned. Status : Pending. Schedule : From 09:00 on 29 April 2019 to 16:00 on 29 April 2019. Lanes Closed : There will be one of two lanes closed. Location : The A69 westbound between the A6085 and the junction with the A68 west of Corbridge. Lane Closures : Lane one will be closed. Reason : Roadworks are planned. Status : Pending. Schedule : From 09:00 on 1 May 2019 to 16:00 on 1 May 2019. Lanes Closed : There will be one of two lanes closed.